In this episode, I will tell you a bit about this witchy podcast and why I do it. I will tell you a bit about my intentions for this podcast, what you can expect to hear, and why I do what I do. I’m also going to give you a prompt, something you can do easily and in a short amount of time, to get some magic into your day. A small caution. If you’re sensitive to language, I must warn you that the occasional swear word might slip through the cracks when I edit. that this is about magic and not physics, chemistry or something similar. Any and all parts that contain information about herbs and remedies is only of historical interest. Any use of this information is entirely your own responsibility and at your own risk. I do not guarantee the function of any of the recipes or instructions. So what are my intentions for this podcast? My intention is for you to get some magic into your day. To share information with you, and inspire you to walk your own path. Each episode will have a central idea like today is about the podcast itself. 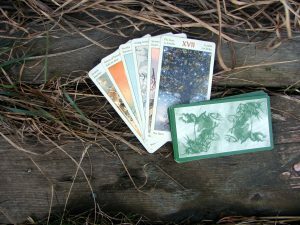 I will talk a little bit about what I’m up to, share some information about herbs, give you a Tarot forecast for the coming week, tell you if I’ve come across something good, and give you a prompt at the end. Every prompt I give you will be easy to do, shouldn’t take much of your time, and shouldn’t require you to go out and buy anything. I’m a big fan of doing what you can with what you have. Some of the things might involve gathering materials from Nature though, but those are free. Maybe it’s time I introduced myself properly. I’m Linda Ursin, The Conjure Queen, a Witch, an Artist and Intuitive Creative Guide. I’m the author of the book Wonderful Weeds – The Forgotten Resource, and I’m also one of the radio show hosts on Cackle Boom Radio, where I host The Conjure Queen Show, Meet the Bands, and co-host Margarita Midnight. I’m also an artist and creative coach, but that’s a subject for my other podcast. I’m 43 years of age, and I live with my husband and daughter in the middle of the Norwegian countryside, but I’m originally from a town in northern Sweden and I moved to Norway in 1999. I’ve been practicing openly as a witch since 1994. The label I place on myself nowadays is a witch or wise woman. My path isn’t easily explained, but you could say that I’m in the ‘hedge’ category (I pick and choose what I resonate with), but my roots are firmly in the Scandinavian traditions. I’m a seiðr practitioner (a form of shamanic practice from Scandinavia) and I do a lot of work with herbs and runes. As a person I’m self-confident, stubborn, cheerful and positive, a bit of a jester, I can talk until your ears bleed, and sometimes that might get a bit annoying. I read a lot, and I call myself an ‘infoholic’ because I need something new to learn all the time. If you’re on social media, look me up. I’d love to get to know you. Today’s prompt: Just go outside today, and sit quietly for at least 10 minutes. Use your senses to experience your surroundings and enjoy Nature. That’s it for me for today. Thanks for listening to the Witch in the Valley Podcast. The next episode will, among other things, be about my path to witchcraft. If you have any questions, just reach out to me at linda@lindaursin.net Remember to rate and subscribe to the podcast on iTunes.